TouchCopy offers easy transfer of all your iPod or iPhone music, photos, podcasts, games and videos. Also, you can copy playlists, artwork, ratings and play counts straight from your iPod into iTunes. TouchCopy also enables you to use your iPod Touch and iPhone as an external disk drive and copy iPhone notes, contacts and SMS. TouchCopy works with all iPod and iPhone models and the iPad. Standard features aside, TouchCopy also has some neat unique features, like the ability to use the iPod Touch or iPhone as an external disk drive and copying of iPhone SMS and Voice Memos. TouchCopy iPod Transfer software also enables iPod and iPhone photos and videos to be viewed and copied to a computer or uploaded onto YouTube. Gaming fans too, will be delighted with the ability to save games from the iPod to a computer or directly back into the iTunes library. Those who like to combine work with leisure will find the business tool useful, allowing iPod and iPhone notes, contacts, calendars and voice memos to be managed and copied between the two devices. TouchCopy works with all iPods, iPads and iPhones, including the iPhone 4 and is compatible with Windows 7, XP and Vista. 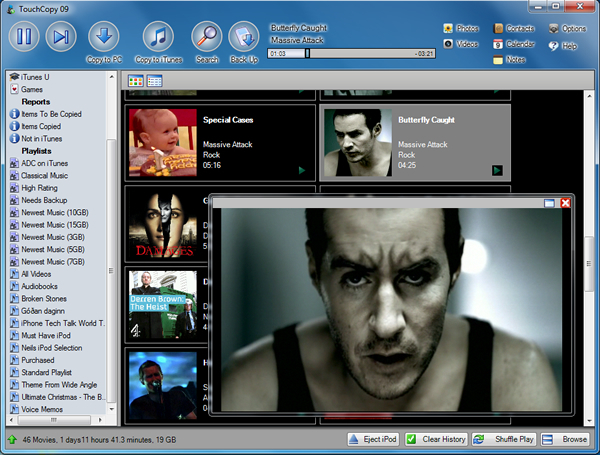 TouchCopy iPod Transfer is available as a free trial download, allowing up to 100 iPod songs or videos to be copied. Qweas is providing links to TouchCopy iPod Transfer 9.96 as a courtesy, and makes no representations regarding TouchCopy iPod Transfer or any other applications or any information related thereto. Any questions, complaints or claims regarding this application TouchCopy iPod Transfer 9.96 must be directed to the appropriate software vendor. You may click the publisher link of TouchCopy iPod Transfer on the top of this page to get more details about the vendor.